Toronto Ontario’s Ailuralive Jewellery is an online ecommerce jewellery store providing dainty, minimalist handmade jewellery. Serving Canada and the United States, Ailuralive Jewellery creates hand made pieces with care. I’m absolutely IN LOVE with the website!!!!!!!!! Everything about it screams my brand!! You’ve been so helpful Marcia, thank you so much 🙂 You’re the best!!! Blue Tide worked with Amina to create a unique WordPress website design that features their beautiful handmade jewellery creations. 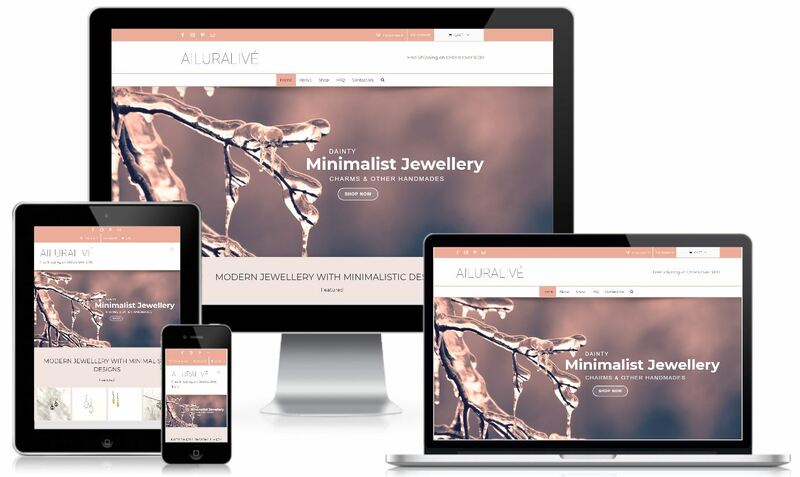 Using modern 2019 trend colours and contemporary visual design elements, the Ailuralive Jewellery WordPress website provides a user friendly ecommerce product browsing experience allowing online searchers to find, visit and engage with the Toronto based jewellery creator. Considering a new website or website redesign in Toronto Ontario for your jewellery store, hand made goods or ecommerce store? Give us a call to discuss website design options and local SEO for sales. Blue Tide is happy to provide free Google internet marketing advice to help clients get the most out of their online investments.